Why is a built-up roof considered a multi-ply roof? ARMA defines a built-up roofing system as a roof where multiple layers of asphalt alternated with ply sheets (felts) are applied over the roof deck (vapor retarder) and, most often over insulation that is attached to the roof decking. Why is a multi-ply better than a single ply? The multiple layers of bitumen and bitumen-saturated “felts” make a water-resistant barrier capable of providing many years of reliable protection from the elements. If the top layer is damaged, the subsequent layers underneath provide a back-up layer to stop water and the elements from entering the building. The multiple layers create a more rigid and stable surface that make the roofing system more applicable to being a platform for your mechanical systems, solar energy systems, vegetative (roof gardens) or creating usable outdoor space by installing a roof deck over top of it. Many single-ply roofs these days are installing “sacrificial layers” underneath solar arrays; mechanical areas; and in high traffic areas to protect the primary membrane from damage. Are BUR multi-ply roofs energy-efficient? Built-up roofing systems exhibit exceptional resistance to the conduction of heat between the exterior and interior of a building, resulting in noticeable reductions in heating and cooling costs. BUR incorporates the roofing insulation into the monolithic roofing membrane and results in better insulation or a higher R value for better thermal performance your roofing system can achieve. BUR may have a ballast layer added to them (local building code permitting) which can increase the thermal performance. 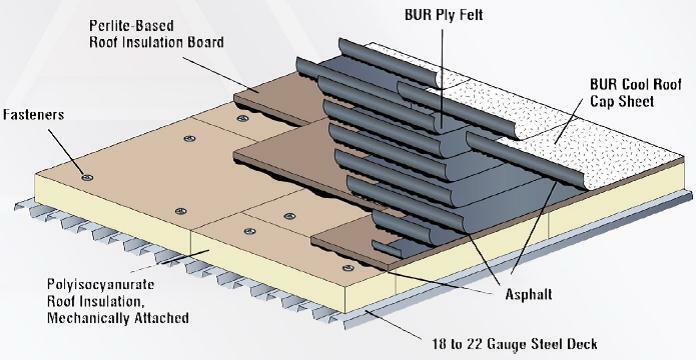 A BUR system generally incorporates insulation in the design of the roofing system because of the multiple layers increasing the insulation properties that can boost the energy efficiency of the system. How does my BUR multi-ply roof provide added protection? Built-up roofing systems are tested through Underwriters Laboratories and Factory Mutual Research Corporation to meet very strict fire resistance requirements and ensure adequate uplift resistance under extreme wind conditions. Uplift: The BUR systems continuously adheres each layer to one another forming a monolithic structure without the need for fasteners. This monolithic layering reduces the number of penetrations and stress points caused by fasteners and increases wind resistance. Fire Resistance: FM1 include the highest fire rating available. UL Class A is the best in the industry. Can an asphaltic BUR roof be used to meet cool roofing standards; earn USGBC LEED points; and meet Energy Star program requirements? A BUR can be coated with UV reflective material to become a more highly reflective “cool” roof. This is typically done with an aluminum coating to increase the surface reflectivity. A highly reflective white coating can be used but special precautions must be taken to ensure the white coating does not yellow over time due to a phenomenon called bleed-through. A BUR system can be covered with a white granulated cap sheet to meet cool roofing requirements. Is a multi-ply BUR economical? Compared to other high performance commercial roofing systems, built-up roofing is one of the best investments on the market today due to its competitive cost per year of expected service life. Low maintenance: Recommended annual inspection to check for clogged drains, gutters, pitch pockets needing to be tipped off, damage caused by a service repairman, etc. A multi-ply smooth surface BUR system can be restored by resurfacing a flood coat of asphalt, a fibered aluminum roof coating, a white or pigmented elastomeric roof coating, and/or asphalt coating and gravel. Multiple-ply means fewer headaches, when using the roof as a platform for your vegetative roof, solar array or outdoor living space. The multiple ply provide added protection so there’s no need for expensive deconstruction of items inhabitation the roof to affect repairs like single-plies. What advances have been made with BUR? As technology has advanced, so has BUR application. In addition to the development of low-fuming hot applied asphalt, hot mopped jobs are giving way to new applications like cold applied. Cold-applied applications reduce exposure to potentially irritating fumes; and the need for hot kettles, while still providing many if not all of the benefits and applications listed above.